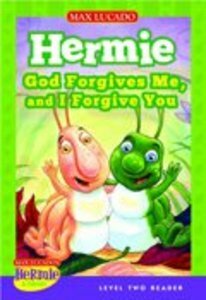 Hermie learns the importance of offering forgiveness and discovers how incredible God's grace really is. There is a lot of excitement in the garden as all the bugs prepare for the harvest festival. Hermie has promised to help Wormie but then forgets. Luckily, Wormie is quick to forgive Hermie. But later when Hermie is the one who is disappointed, will he be able to forgive too? God gently reminds Hermie that God continues to forgive us when we make mistakes, and it's important that we do the same for others. The third title in the Hermie & Friends Level 2 Reader series, this book is perfect for beginning readers who need to build their confidence and still enjoy fun illustrations. Plus, parents are pleased to know that the story reflects the concepts taught in Jesus? parable of the unforgiving servant (Matthew 18) and teaches young readers about God's grace and forgiving others. About "God Forgives Me and I Forgive You (Level Two Reader) (Hermie And Friends Series)"
This great value omnibus brings together four stories from Max Lucado's bestselling Hermie and Friends series. Inside you'll find Hermie, a Common Caterpillar (on being special); Flo, the Lyin' Fly (telling the truth); Webster, the Scaredy Spider (courage); and Buzby, the Misbehaving Bee (following the rules).